iTALC is a free and open-source classroom management tool for teachers. It lets you view and control other computers in your network in several ways. It supports Linux and Windows and it even can be used transparently in mixed environments! The default version in Ubuntu repository is old. I’ve upload the latest iTALC 2.0.1 packages into PPA for Ubuntu 13.10, Ubuntu 13.04, Ubuntu 12.10, Ubuntu 12.04 (Debian package belongs to Mike Gabriel). 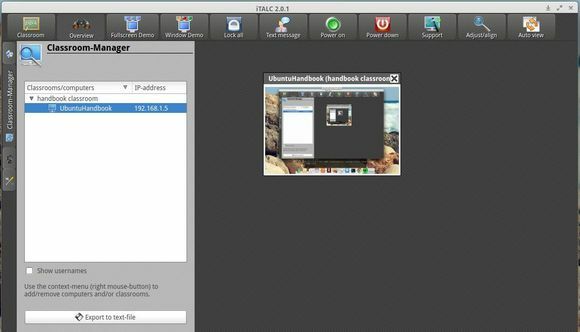 For student, just install italc-client. For Ubuntu 14.04, you can directly install the latest packages from Ubuntu Software Center. This will create the private & public folder under /etc/italc/keys directory. 3. The public folder need to be sent to the students machines. In the keys/public/teacher folder, there will be a file called key. Rename that file to italc_dsa_key.key.txt. When prompted, select Import Public Key Of Master Computer, navigate to the file where the italc_dsa_key.key.txt file is housed, click Next, and finish the wizard. 1- It does not run “ica” automatically, so you should execute it manually. I have italc-client installed on my LINUX machines and italc-master on a Win7 machine. But wether I copy the keys folder to the Linux machine or import the public key via imc – I just don’t get it to work. Great work, I have install it for a school and it works great on Ubuntu 14.4.3 and some Win32 and 64 , you have to set the ssh key right otherwise will not start from the desktop menu, you have to be su as start then it is over and complete.